October is Respect Life Month! 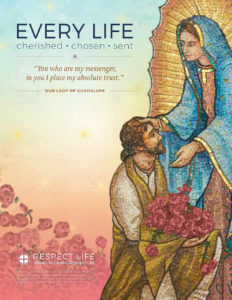 This year’s Respect Life theme is “Every Life: Cherished, Chosen, Sent,” highlighting our call to build a culture of life as missionary disciples. It’s time for us to renew our commitment to defending those most vulnerable in our midst. There are many ways we can get involved in our parishes, and our own prayer lives. In a recent statement, Cardinal Daniel N. DiNardo of Galveston-Houston, President of the U.S. Conference of Catholic Bishops (USCCB), wrote on July 6, urging that support for Roe v. Wade not be used as a litmus test for judicial nominees in their deliberations about the recent vacancy on the Supreme Court of the United States. You can read Cardinal Daniel N. DiNardo of Galveston-Houston’s entire statement here. Statement to the members of the Senate. The Missionary Oblates JPIC continues to advocate that “Human life must be respected and protected absolutely from the moment of conception. From the first moment of existence, a human being must be recognized as having the rights of a person – among which is the inviolable right of every innocent being to life.” CCC 2270.